Summer is the perfect time for a wedding; the weather is usually warm and there should be plenty of sunshine for those of you who want a day wedding. The evenings stay warm and light, which makes for excellent evening weddings, too. Nothing can add that final touch of love and romance to your special day better than our heart-shaped wedding sparklers. You've spent more hours than you really care to count making sure that every last detail of your wedding has been taken care of. Yet, no matter how many times you go over your completed list, you can't help thinking something is missing. You need something that is going to take your magical day to the next level. That one thing no one else you know has thought of. The one thing that will make your wedding day memorable for all in attendance. 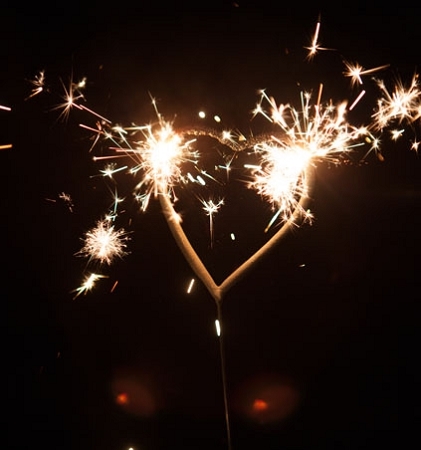 What you need is a supply of our heart shaped wedding sparklers. Why Our Heart-Shaped Wedding Sparklers? There are many reasons why you should include these 11-inch wedding sparklers in the various events on your special day. These sparklers burn for a full 50 seconds, forming a glowing, sparkling heart at the end of a metal wire handle. They are available in standard gray sparkler or in glowing red to help you match just about any theme. Like all of our wedding sparklers, these are made from steel wire and are virtually smokeless. This makes them ideal for both indoor and outdoor use. Due to their smokeless nature, you can use them to add a special touch to your wedding photographs without a haze of smoke ruining the shot. Line the Aisle: Give your wedding guests along the processional aisle glowing wedding sparklers as a way to highlight the bride on her walk towards her future husband. On the other hand, you could wait until after the vows have been exchanged to have them light the happy couple’s way back down the aisle together, as husband and wife. Wedding Photos: You can turn ordinary wedding photographs into something quite extraordinary. Our 11-inch wedding sparklers are perfect for inclusion in your wedding photographs. They burn for approximately one minute, giving the photographer plenty of time to get the shot. On top of this, all of our wedding sparklers burn virtually smoke-free, making them perfect for your photographs. During the First Dance: They are also safe for indoor use, making them a fun addition to your wedding reception. Make sure your guests have access to plenty of our heart shaped wedding sparklers, so they can light up the happy couple's first dance together as husband and wife. As you can see, that final missing touch for your special day is heart shaped 11-inch wedding sparklers! Visit Wedding Sparklers Outlet and take a look at our selection of sparklers, sparkler tags, and confetti cannons to help make your wedding day unforgettable.